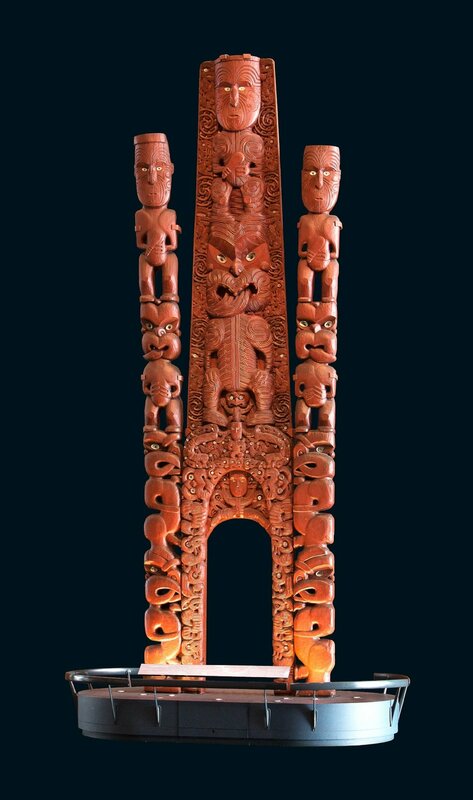 This is one of the most photographed objects in the national museum of New Zealand: Te Papa Tongarewa. It stands proudly in the main foyer of the museum. It is a very large carved gateway (waharoa) which was carved in 1906 as a show piece for an International Exhibition. Te Papa wanted to create something that helped museum visitors find out more about the waharoa, so that they take away more then photographs; they leave with the stories it contains. This was an early test case for Curio which has resulted in an interactive that lets visitors click on details on the object and hear the stories that are contained in the carvings. These are told by a direct descendant of the original master carver, Jim Schuster from Ngati Tarawhai, whose voice brings the object alive. Audio recordings were made and some images and text were added in using the Curio publishing platform. These were added to highlights on the object and then published out to an iPad on the museum floor. Visitors have loved being able to find out more, and exit interviews suggest that they leave the experience with new knowledge and a greater appreciation of the object. Allowing visitors to zoom in on detail, and discover stories for themselves makes this so much more engaging than just a static object label. How do we know? We know because we conducted observational studies before and after this interactive was installed. That's a whopping increase in engagement; simply by telling the story of the object well.